The most prominent uncertainty facing markets in 2018 is central bank balance sheet unwinding. For the first time since the financial crisis began, this year the Federal Reserve will be a net seller of assets (if everything goes to plan) meanwhile, the European Central Bank and Bank of Japan will be winding down their asset purchase programs. The Fed is winding down its assets with initial monthly caps on runoff of $6 billion for Treasuries and $4 billion for mortgage-backed securities. The caps will increase every three months by $6 billion and $4 billion, respectively, until they reach $30bn for Treasuries and $20bn for MBS. 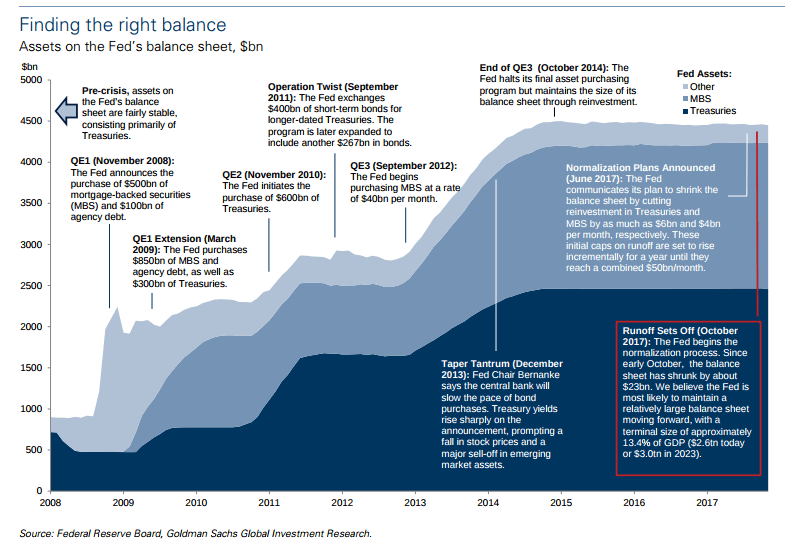 As the Fed's balance sheet run-off gains traction next year, Goldman estimates the CB will sell off $400 billion of assets during 2018. At the same time, the ECB announced in October its intention to reduce the Asset Purchase Programme (APP) run-rate from €60 billion to €30 billion per month as of January until September 2018 or beyond. Meanwhile, even though the BoJ’s official JGB purchase target remains ¥80 trillion /year, its actual annual pace of purchases has fallen to around ¥61 trillion. How the markets will react to the Fed unwind remains to be seen. So far, they have taken the runoff in it their stride, but as it gathers pace, analysts are finding it difficult to predict what happens next. According to the managers of the Odey Odyssey Fund, Tim Bond and Dipankar Shewaram, in 2018 the magnitude of the shift in the balance of borrowing and saving will amount to $420 billion, or 2.2% of current GDP and "in 2019 and 2020, the balance sheet unwind would be equivalent to $600 bill extra borrowing each year, or 3.1% of current GDP. In comparison, the domestic household and business sectors are currently running a net positive savings balance in the region of $400 billion. To meet the extra savings requirement, households and businesses will have to put away more, leading to disastrous effects for risk assets. "To put the changes into a global context, the $600 bill balance sheet reduction that the Fed proposes for 2019 is equivalent to 2.9% of IMF’s calculation of the flow of global gross savings. A shift of this magnitude is going to leave an impression on asset prices...Unwinding QE should lead to higher real interest rates, a widening of risk spreads and slower than otherwise global nominal GDP growth due to the required increase in the global saving rate." However, the real challenge will come when the ECB starts to unwind its balance sheet. The ECB unwind will be the event to watch over the next two years. Markets might be taking the Fed unwind with no response, because the ECB is still printing money via its Asset Purchase Program. Assets on the ECB balance sheet are closing in on $5.5 trillion, around $1 trillion more than the Fed and BoJ. The size of the CB's balance sheet now means that it is the "biggest swing factor in terms of when G7 central bank expansion turns into outright balance sheet contraction, a development which holds obvious risks for stock markets and asset prices in general" according to analysts at CLSA. Even though it's unlikely that the CB will turn off the printing presses until the end of next year when it does the world will be watching. Combined with the Fed runoff, the ECB sell-down will mark the first time since 2007 that central banks have made net withdrawals from the financial system. It's worth noting as well that right now, the 1-month Euribor is a negative 0.37%, so there's much more potential for tightening in Europe than America. "If we assume the ECB’s QE program is wound down next year, the increased call on savings from the Federal Reserve and the decreased supply of savings from the ECB would be equivalent to an annualized 1.3% of at 2017 World GDP at the end of 2018 and 1.6% at the end of 2019. On a global basis, the required increase in savings can only be met by a decrease in spending. It is therefore difficult to see how the shift in Fed and ECB policies towards ending or unwinding QE is not going to provoke slower than otherwise nominal global GDP growth." Financial markets are unprepared for this risk. Odessy's managers believe that as central banks start to unwind their balance sheets, the compression of risk spreads (widened by QE buying) will reverse towards a more normal relationship with risk assets. The de-compression of spreads will hit bond fixed income and risk asset investors severely considering the size of the potential unwind.